Hercules floor to floor joints are aluminium extruded joints suitable for floor to floor locations, floor to wall. Other provisions are also available depending upon the location of the gap such as landscape area, traffic and non traffic areas. Combination floor joints are employed to accommodate large movements. • Aluminium joints for floor locations. • Drawings and installation processes of the contract, including general conditions, work included, additional conditions, general requirements applicable to the work. • ASTM B209 – Standard specification for Aluminium and Aluminium-alloy sheet and plate. • For 1” to 24” expansion joints. Higher ranges available upon request. • Accommodates up to +/-50% of the joint-width movement. • Suited for new/retrofit jobs. • Range of colors to suit surrounding. 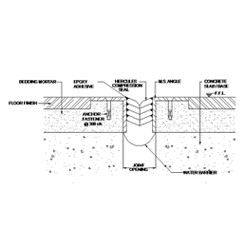 • Provision of moisture barrier. 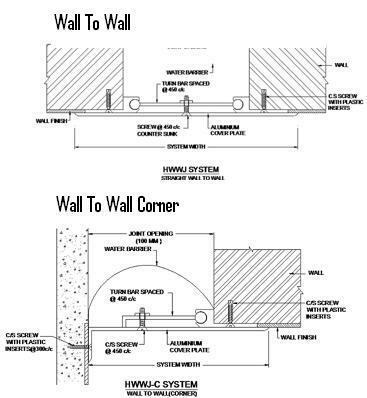 Hercules wall to wall joints are aluminium extruded joints suitable for wall to wall, wall to roof and wall to wall corner locations. • Aluminium joints for wall locations. • They shall be constructed of Aluminium for wall. Grade ASTM B209. 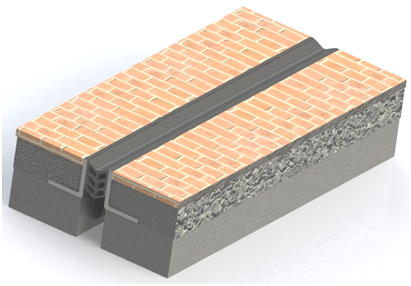 Hercules roof to roof joints are aluminium extruded joints suitable for roof to roof, roof to wall corner locations. • Aluminium joints for roof locations. • They shall be constructed of Aluminium for roof. Grade ASTM B209. Hercules ceiling to ceiling joints are aluminium extruded joints suitable for ceiling ceiling locations. • Aluminium joints for ceiling locations. • They shall be constructed of Aluminium for ceiling. Grade ASTM B209. Combination joints are employed to accommodate large movements. These joints absorb any of the three movements i.e. axial movement, lateral deflection and angular rotation. 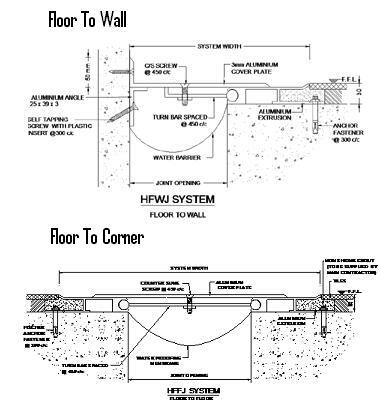 It is able to accommodate thermal as well as seismic movements. 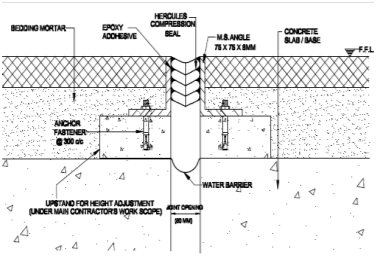 Hercules Strip Seal Joints are robust, watertight joints, capable of horizontal and vertical movements and conforming to MORTH specifications are installed in hundreds of Bridges all across India and Asia-Pacific. 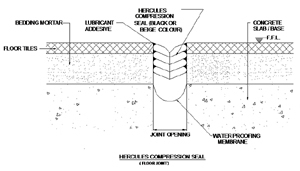 Strip seal joints offers ease of installation and effectively seals the joints in Bridges and structures. In landscaping, materials used for expansion can be wood, rubber, bitumen, plastic, felt, silicone, polymers or even a few millimetres air gap. In the case of wood, this material by its nature will naturally rot after a period or exposure to water and air and leave a void when it's completely perished. Unsightly weeds will often grow in the deposits that form in the space where the wood once was. 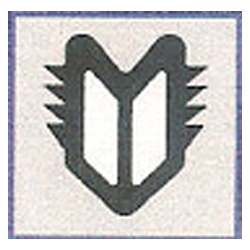 These are vertical or horizontal joints that are used between two successive pours of concrete. Keys are used to increase the shear resistance at the joint. If keys are not used, the surface of the first pour is cleaned and roughened before the next placement of concrete. Keys are almost always formed in the base to give the stem added sliding resistance. The base is formed first, and the stem constructed afterwards. To appreciate the complexity of ramps in car parks one has to recognise that there are many types of ramps used in many different situations. The Arrow Joint System is a Structural Sealing Joint System for bridges, elevated highways, parking structures, stadiums, tunnels, water treatment facilities and other engineering structures. 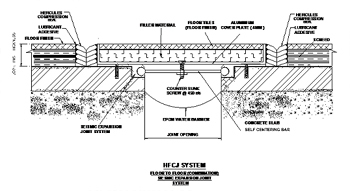 Since 1972, this system has proven that it is the most durable, versatile, cost effective and watertight small movement expansion joint system in the industry. 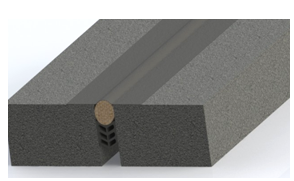 RAPID TURNAROUND – The Arrow Joint System is not just another expansion joint. The advantage of rapid turnaround, coupled with durability and versatility, has led the engineering community to specify the Arrow Joint System for hundreds of thousands of linear feet of expansion and isolation joint installations around the world, in an endless variety of markets. 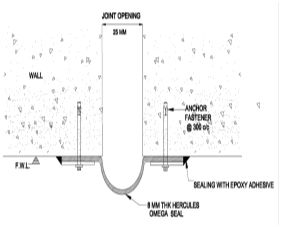 SUPERIOR ISOLATION JOINT SEAL – The Arrow Joint System can be installed as an isolation joint where other expansion joints may fail to perform. 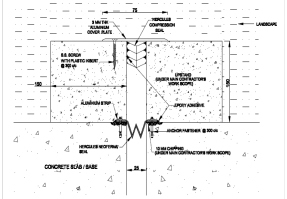 When the design calls for the movement of different structural elements as well as a watertight expansion joint, the Arrow Joint System is most often chosen. Unlike most conventional expansion joints, the Arrow Joint System has been designed to accommodate forces associated with multi-directional movements. It is also resistant to hydrostatic pressure where other expansion joints are not. Therefore, it can be used as isolation joint to allow for the combination of shear, rotation and skew movements, while acting as a watertight expansion and contraction joint seal. STATE OF THE ART DESIGN – The state of the art Arrow Joint System is comprised of a neoprene Profile which is Air Pressurized and bonded in place with a specially formulated Epoxy Adhesive. These three elements, combined with unsurpassed field technical support, are the keys to success of the Arrow Joint System. 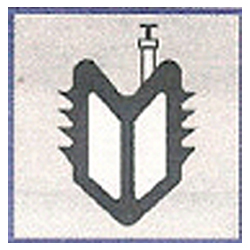 Each Arrow Joint System is comprised of the same key elements, only the size and profile shape change. NEOPRENE PROFILE – The Arrow Joint System profiles have been engineered from a tough and durable neoprene (synthetic rubber) material that is precision extruded to exact design tolerances. These profiles have outstanding resistance to degradation from ozone, weathering, oils and most other chemicals. The sidewalls of each profile are extruded with multi-raised ribs. 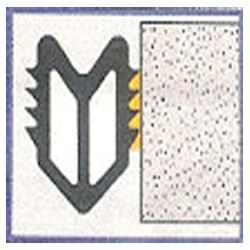 The ribbing maximizes the available epoxy adhesive surface bond area. EPOXY ADHESIVE – The epoxy adhesive is a two component, solvent less, non-sag adhesive, which was developed especially for bonding the neoprene profile to concrete, steel and other dissimilar materials. 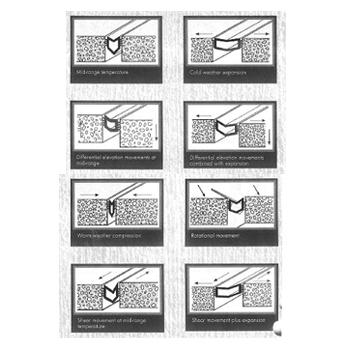 The advantage of the epoxy adhesive over conventional mechanical anchors is that it transfers the compression, tensile and flexural stresses uniformly along and across the bond line. PRESSURISATION – Prior to installation, the sidewalls of the actual joint and the ribbed area of the neoprene profile are coated with the non-sag epoxy adhesive. The neoprene profile is then placed into the joint gap and aligned. After alignment is complete, the neoprene profile is inflated with air. The air pressure expands the neoprene profile which forces the epoxy coated rib walls of the profile against the epoxy coated sidewalls of the joint and into the pores of the neoprene. As the profile expands against the sidewalls, excess epoxy adhesive is squeezed out and the profile conforms to the sidewalls, ensuring a watertight fit. When properly installed, the high performance Arrow Joint System will not tear away, protrude out of or slip down from its original position when exposed to repeated mechanical and thermal movements. In addition, the neoprene profile and epoxy adhesive protect the joint from abuse associated with dynamic movements and impact loads while remaining watertight. Wide Range Of Movement Forces – The Arrow Joint System’s design inhibits water intrusion, while providing movement ranges from 66% to 100% of the profile width, depending on the expansion of the profile selected. Conforms To Changes In Structural Elements Direction – The Arrow Joint System is extremely versatile; it will conform to changes including vertical and horizontal changes in elevations, crossovers, T-intersections and joint gap dimensions. This versatility enables the Arrow Joint System to be installed in many applications where other expansion joints would fail. Quick Installation – The Arrow Joint System was designed to facilitate rapid “return to service” of the structure. By minimizing downtime and improving productivity, structures can be fully operational in record time.